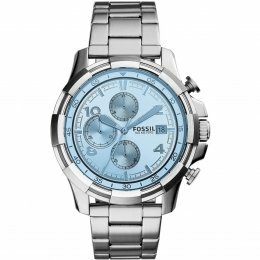 The Fossil FS5155 Men's Watch features a blue tinted crystal dial with silver toned hands and Arabic numerals. 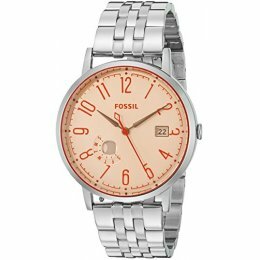 This Fossil Watch has a durable stainless steel strap and extra large gears creating an easily readable dial.The silver stainless steel FS5155 Watch is specifically designed for the up to date man by Fossil Dean Collection. 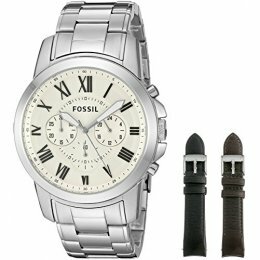 The Fossil Grant FS5123-SET is a men's watch with a novel design reversible face and strap. With an effortless turn of the case, one side shows a smooth cream finish, the other a black satin finish.The Fossil FS5123SET Watch has interchangeable leather straps which enables you to transform the look of your unique Fossil Grant Watch when you desire. The Fossil ES3957 Watch features a rose-tinted crystal lens with a Fossil logo. The classy Vintage Muse boasts American-designed Arabic numerals with a day of the week window. The Vintage Muse ES3957 Ladies Watch is designed with a stylish stainless steel bracelet strap, quartz movement and silver-toned dials.